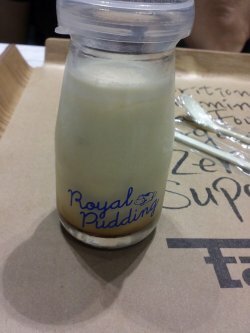 As i had heard many great reviews about royal pudding from Paris Baguette, i decided to order the original milk custard pudding. The pudding itself is milk flavoured and it has caramel sauce at the bottom. The pudding is extremely soft and silky, texture is similar to the 'LaoBan' beancurd. You can dig to the bottom to savour both the pudding with the caramel sauce! Overall, it is a sweet and nice dessert! Will try out their cakes soon!